Inventory We are a resale marketplace, not a box office or venue. Ticket prices may exceed face value. This site is not owned by Bridgestone Arena . 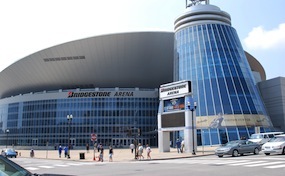 Bridgestone Arena (formerly Sommet Center, Gaylord Entertainment Center and Nashville Arena) is an all-purpose venue in downtown Nashville, Tennessee, that was completed in 1996. The Bridgestone Arena is owned by the Sports Authority of Nashville and Davidson County and operated by Powers Management Company, a subsidiary of the Nashville Predators National Hockey League franchise, which has been its primary tenant since 1998. The Predators hosted the NHL Entry Draft here in 2003. ArenaNashville.com is not affiliated with any primary box office or supplier. We are a privately owned and operated business specializing in sales in the secondary market. To buy tickets for any Nashville Arena events in Nashville simply click on the event of interest or call our operators at anytime.